Try Marine Street Beach if you are looking for a sandy quiet beach in La Jolla, California. This pristine public beach is mainly used by locals, and is a great place to get away from the crowds. If you are looking for a family beach where children can play in the gentle waters, this is not your beach - try La Jolla Shores instead. Marine Street Beach is known for its white sand and quiet location, tucked away in a residential neighborhood in La Jolla, away from the tourists who frequent Children's Pool, La Jolla Cove, and La Jolla Shores. 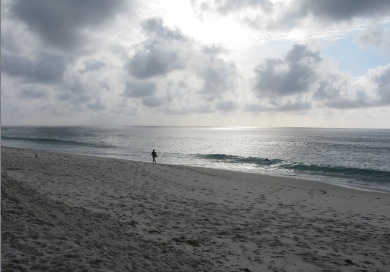 While the sand is beautiful, the water can be quite rough, so this is not recommended as a family beach. 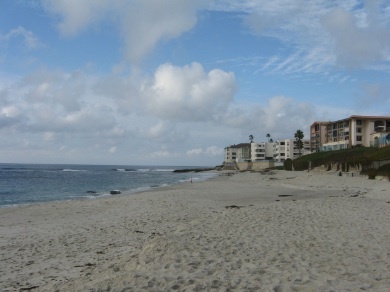 Location: Pacific Ocean in a quiet neighborhood in La Jolla, at Marine Street & Neptune Place, San Diego, California. Parking: Limited free street parking available. It is best to arrive early especially in the summer and weekends. Getting There: Short walk to this easy-access beach from street parking, down a small flight of steps. Things to Do: Walking, jogging, sunbathing, body boarding (experienced only) and body surfing (experienced only, surfing (experienced only), scuba diving, fishing, photography, walk north to Hospital Point at low tide to explore tide pools. Facilities: Not much. No restrooms. Lifeguard: Lifeguards during summer and holiday weekends. Things NOT to Do: No children or inexperienced swimmers in the water, no alcohol, no glass containers, no smoking, no littering, no disturbing noise, no overnight sleeping, camping or parking. Hazards: Sunburn because you won't want to leave; rough surf, rocks, rip currents. Directions – from Interstate 5 go west on Genessee Avenue. Turn left on Torrey Pines Road, left on Girard Avenue, right on Pearl Street, left at La Jolla Boulevard, then right on Marine Street.